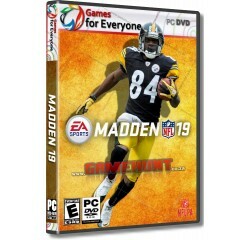 Madden NFL 19 - R280,00 : Game Hunt, Where we lead, others follow. Enhanced control - Player experience is at the forefront of Madden NFL 19. Advances have been made to give players more control and responsiveness while bringing in fresh gameplay concepts to push Madden to unbelievable heights. Real Player Motion - Real Player Motion is designed to deliver hyper-realistic animations with a higher level of gameplay. The elevated animations bring incredible elements to the ball carrier control. Next level visuals - Last season broke visual ground with the inclusion of the Frostbite Engine. Madden NFL 19 will flex more of the Frostbite muscle, providing broadcast-quality graphics for a level of immersion for the ultimate gridiron gaming experience. Processor - Intel i3-4350 or equivalent passmark® or equivalent AMD® processor.